Why pray? Why pray the rosary? Why did the Blessed Mother ask us to pray the rosary at many of her approved apparitions? Why are we supposed to pray at all? but he loves us and wants us to be happy. And he wants to have a loving relationship with us both now and for eternity. God is potentially the greatest source of happiness we can possibly have as God is the greatest, the most beautiful, most loving, all-powerful and all-knowledgeable being in existence... much greater than we can even imagine (even potentially greater than falling in love with someone here on earth). We can get glimpses of what God is like through the good things he has created, hopefully without letting them sidetrack us from loving and putting God first as we should. Prayer is a way to help us get in touch with God and to develop a relationship with him. In prayer we not only talk with God, but God communicates with us. As we continue to pray, our relationship with God grows, and we are transformed more into the people we are meant to be. that yields its fruit in its season, and its leaf does not wither. So why pray the rosary? The rosary is not only a vocal prayer but also a meditative prayer. So what is meditation? It was interesting to me that the Blessed Mother appeared in the St. Anthony Church at Fatima to seven-year-old Jacinta, one of the Fatima seers. There she taught Jacinta how to meditate on the mysteries of the rosary by showing her 15 tableaus (pictures) of the joyful, sorrowful and glorious mysteries. Mary taught her to meditate on the mysteries by forming images of the mysteries in her mind as she prayed the Hail Marys. Praying the decades (10 Hail Marys) of the rosary is not about focusing on the meaning of each word of each prayer. Rather it is about pondering the mystery for that decade. For example, the first sorrowful mystery is the Agony in the Garden. While a person says the 10 Hail Marys for that decade they might think about how Jesus was in the Garden of Gethsemane and what Jesus said and did there. To do this it helps to know the Gospel passages regarding the mysteries. The rosary is a prayer of the gospels as we not only meditate on the gospel scene, but most of the prayers are also taken from Scripture verses. How does contemplation fit into this? While meditation is a very good form of prayer, and even necessary, contemplation is a higher form of prayer. By contemplative prayer Im referring to the type of contemplation that the saints talk about. St. Teresa of Avila and St. John of the Cross are both experts on contemplative prayer and they not only experienced it but taught about it in their writings. They say that contemplation is not something we can produce through a method or when we want to, but is given by God and is a gift of God. Also called infused contemplation, it is something we cant produce, nor can we prolong it, since it is Gods action. Some of the saints have said that if we are meditating or praying vocally and feel God is leading us to contemplation, that we should allow this to happen rather than trying to force ourselves to meditate at that time or finish our devotions if we run out of time. St. John of the Cross in his writings gives three signs which taken together indicate the beginning of contemplation in our prayer life and when to set meditation aside at least for the moment. For more information, see St. John of the Cross signs explained in my book, How to Pray the Rosary as a Pathway to Contemplation. This book also includes more about how to meditate on the mysteries of the rosary and has scripture passages and artwork for each mystery. It also has tips on how to help children want to pray the rosary with the family. 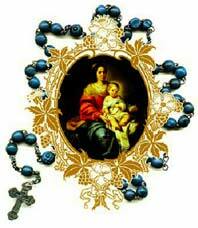 To sum up, the rosary is a prayer highly recommended by the Blessed Mother herself as well as popes and saints. It has very many levels to it from vocal prayer, to meditation and is also a pathway to contemplation. The goal is a greater love for God and union with God. Save $4.00 each or Save from $11.90 -$169.50 on multiple orders. They also make great religions gifts for birthdays and Christmas. To order click here: http://www.catholicspiritualdirection.org/rosarybookcolor.html. The "Seeking Union with God" Online Spiritual Formation Course has twelve lessons that you work through at your own pace. Its teachings on the spiritual life draw from the Bible, Church and Saints. For information and to signup go to www.CatholicSpiritualDirection.org/csfsignup.html. For information on Personal Spiritual Direction through e-mail go to: www.CatholicSpiritualDirection.org/personaldirection.html. by mail to: Kathryn Marcellino, PO Box 40, Gladstone, OR 97027. Notice: This newsletter is sent only to those whose e-mail address has been entered into our signup page at our website. Information on how to subscribe or unsubscribe is below.